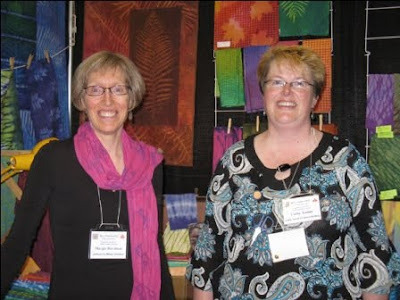 My good friend Sharon took some photos of me and my friend Margie Davidson at our sales booth in Calgary. We had the best booth with lots of colour packed in a little space. 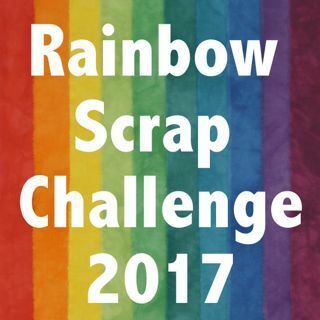 Back in Aug last year Margie asked me if we should share a booth to sell our dyed and painted fabric. Well we did it. We had an incredible amount of fabric packed in to our 10 foot booth. We always had a people in our booth. Here is both Margie and I. Margie is wearing one of her scarfs that she has dyed and block printed. Behind Margie and I is some of her fabric. I am not sure if I will travel to another Quilt Canada to sell fabric. This time it was close to home (3hr) next time it is far far away and I would have to fly. Not sure it would be worth it to travel that far. 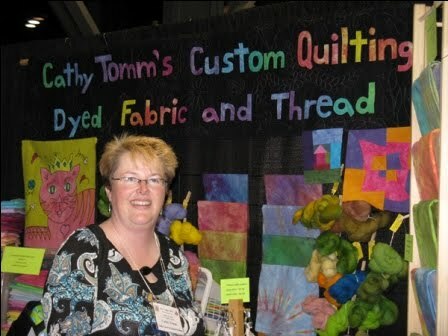 You may see me at more local Quilt shows.